1. 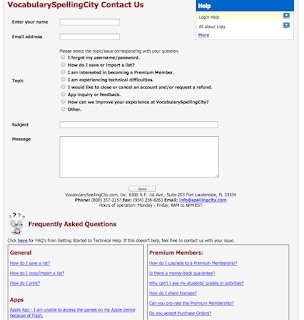 The relationship between the FAQs and the question asked is entirely for the user to make. There is no integrated knowledge-base which would provide super rapid responses using technology. There is a great collection of constantly updated FAQs and training videos. 2. It is very "batch" oriented, not immediate. There is no chat nor a suggestion that we can immediately answer their question is a very interactive way. 3. The design is pretty primitive. Functional but primitive. 4. It is not a responsive design. 5. The "contact us" is a separate page. If a user is logged in, the fields for the user are automatically filled in which is good but still somewhat primitive by today's standards. I think the state of the art is for "Contact Us" or better yet: "Have a question or suggestion?" to be a widget that can be deployed across the site. For instance, we have a new great page of training videos that run from 30 seconds to 30 minutes. That would be a great place to ask "Still have a question?" What's particularly interesting is that VocabularySpellingCity customer support is spectacular. We answer hundreds of calls and emails daily. Less than 1% of our calls ever go to voice mail or become "abandons." And this stat is true not only across weeks and months but we track it everyday and we review it on a daily basis. We use Desk to track all of our calls and emails and "Call Sweet" to monitor our calls and how they go. We manage even on the very busy days (ie August to September) to never give me an annoying recording about "Your call is important to us." BTW: Rant Alert! Am I the only one who feels that it is totally cheesy and Orwellian to put people on hold (showing that you are being cheap on customer support and don't staff adequately (or that your software is creating problems) and then instead of apologizing, tell people why you essentially ignore them how much you value them and their call? We don't do that. Next steps. I'd like to collect a number of modern awesome examples of customer support systems and use them as a model for us to build on. Any suggestions?